It’s been a long, long time since the last blog. Sorry! We have been busy – more of which later. But for now, I’d like to share some initial results from the work we’ve been doing looking at time-of-day of usage and outcome. Previous work by Manchester Metropolitan University suggested that overnight usage is linked to poor grades for students. 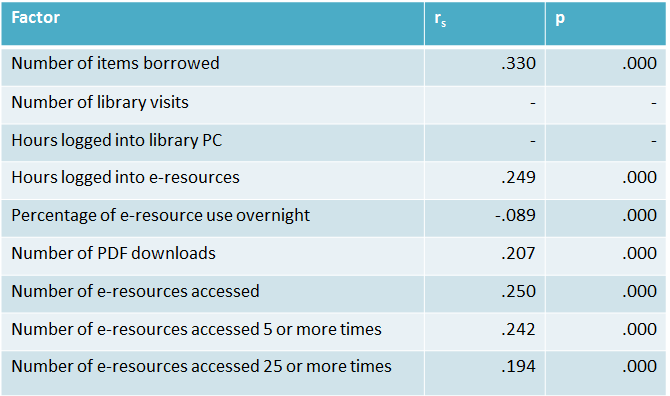 This makes intuitive sense: surely it can’t be a good sign if someone based in the UK is using library resources at 3am on a regular basis – that looks like someone who is struggling with their workload. We wanted to test whether this finding would hold true with the Huddersfield data. At first glance it seemed like it might. 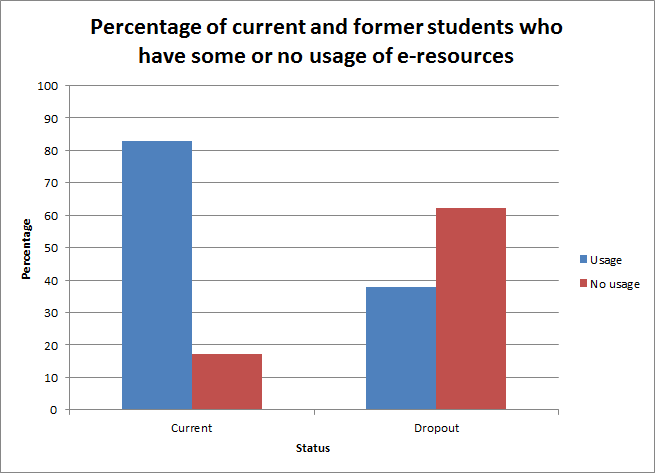 Look at this graph, showing the e-resource usage patterns for students with all four grade outcomes over a 24 hour period*. The firsts have much higher usage than anyone else during the daytime; at night, although the timings become similar, the students who achieved thirds seem to have the highest use (around 4-5am). But that’s not really a fair comparison. We know from the Phase 1 work that there’s a positive relationship between usage and outcome – in other words, the higher your grade, the higher your usage. 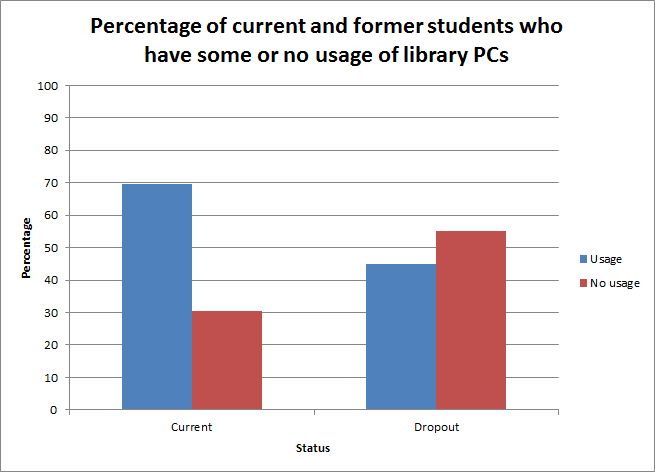 So maybe what the first graph is showing is just that people with firsts have higher usage – full stop. The difference isn’t related to time of day at all. To test this, we created a new variable, looking at the proportion of usage that happened within a certain hour, measured as a percentage of overall usage. This eliminates any bias which might emerge by considering overall usage. 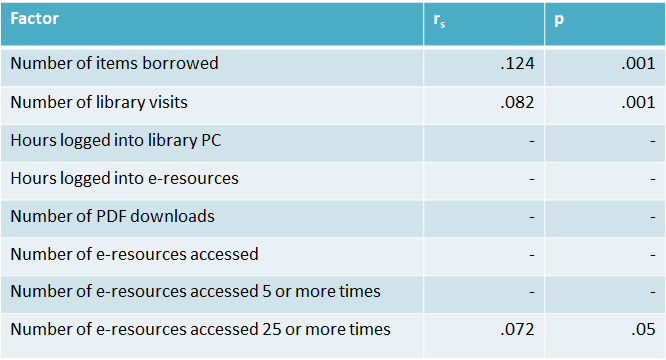 For example, a student who logged in to e-resources 20 times, 2 of them between 10-11am would have the same figure (10%) as a student who logged into e-resources 400 times, 40 of them between 10-11am. The much higher overall number of the second student becomes irrelevant, and we’re able to look at a true reflection of usage patterns. The following graph shows what happens. What a difference! The lines are almost identical. Again, you can see that there’s a point around 9pm where users who go on to achieve a third overtake users who go onto achieve a first, and they maintain their dominance around 3-7am. 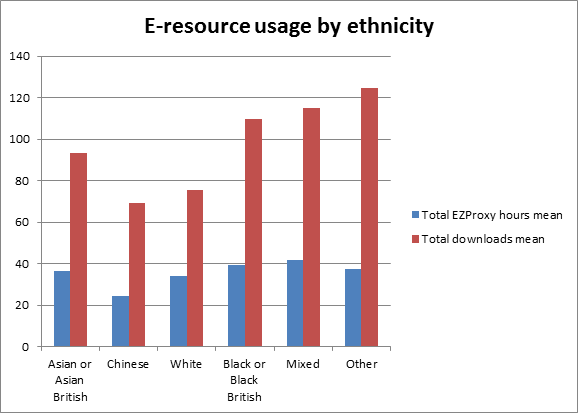 But the overall message is that patterns of e-resource use don’t differ very much by outcome, it’s just the volume. We tested these findings and, sure enough, although there is a statistically significant difference in overall usage between 9pm and 9am for researchers with different grades, there is no statistically significant difference in the percentage of overall use which takes place within that timeframe. So we’ve found something different from Manchester Met. I should stress that our methodology is different, and more simplistic, so it may just be that we haven’t managed to identify a relationship that does exist – perhaps, once you factor out lots of the other variables which affect outcome, a relationship can be detected. But you’d need a lot more data to do that, and a much more complicated model. * When we say ‘usage patterns over a 24 hour period’, we’re actually aggregating the whole year’s data. So 3 logins between 10-11am means a user has logged in 3 times during that hour over the course of a year. We don’t count multiple logins in a single hour on the same day (e.g. someone logs in, times out, and logs in again – that’s just one login as far as we’re concerned). There’s a little bit more methodology here – but also some results! I promise! I have been trying to organise the data so that we create some useful variables ready for analysis. As I said in my last post, you need to know what your data actually means before you start analysing it. But sometimes you will also need to manipulate it before you start your analysis, because the variables you’ve been given aren’t quite right for the analysis you want to do. 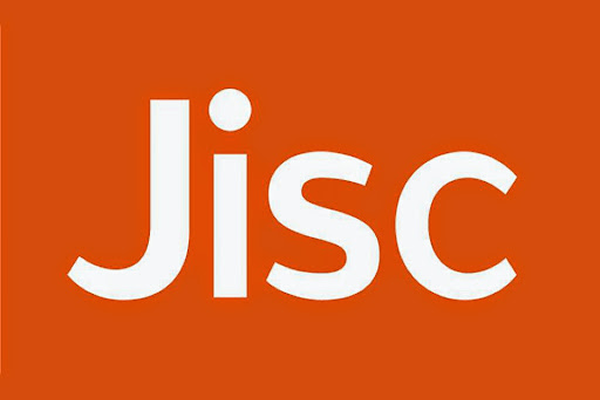 One of the aims of the project is to understand the characteristics of people who use the library in a bit more detail. 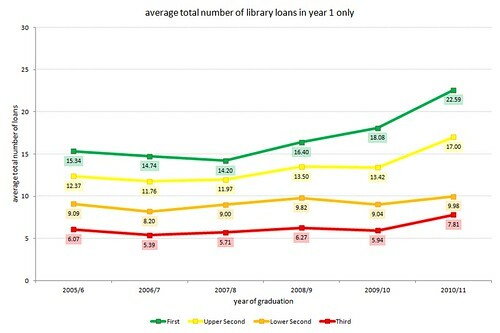 Now we know there’s a relationship between usage and attainment, we need to know whether there are any groups who use the library less than others, so that interventions can be targeted towards them. We’re going to look at a number of factors, including gender (Dave’s already posted some early graphs on this), ethnicity, country of origin, age (again, Dave’s got some graphs) and discipline. 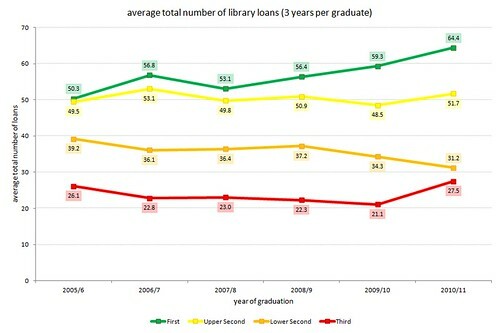 Now, to return to my point about manipulating the data – we have some very detailed information about these characteristics for students at Huddersfield. In fact, in some categories there are only half a dozen students. If we were to use this data, it might be possible for a reader to identify individual students, which is a BIG data protection no-no. So instead, we need to aggregate up. And that raises all sorts of questions. What are the best groupings we can arrive at in order to (a) protect the students and (b) remain theoretically consistent. It might be, for example, that by aggregating the Chinese and the Black – Other categories we could reach a number which would guarantee students can’t be identified – but do we really think those groups have anything in common with one another? Probably not. So it doesn’t make a lot of sense to bung them in together when trying to understand their library usage. These data are aggregated – each category, apart from Chinese, contains at least 2 different groups from the original data. If you look at the graphs showing the original datasets, which I can’t share here because some of the groups are too small, you can see that there are considerable differences between groups that we’ve aggregated. So that’s something we’ll need to bear in mind – that differences between the groups within our aggregates might be so big as to require us to rethink our groupings. If they don’t all look similar, perhaps it’s not helpful to group them together? And here’s the same kind of graph, looking at country of domicile. Again, that’s been aggregated up, in this case by Huddersfield in the original data that was sent to me. I think I’m going to have a play to try and find a happy medium between their highly-aggregated data and the very detailed country-level data, which would reveal individual student identities. I’m particularly interested in what’s going on with those high downloads in the European Community data. I don’t think it’s just an outlier, as there’s a reasonable sample so one or two high usage levels shouldn’t skew the overall picture. So is there a big difference between, say, Balkan states and older EU members? I suspect that some librarians might be a bit uncomfortable with the idea of using such personal data about students. Ethnicity in particular can be a very sensitive issue, and we will have to tread carefully when we talk about differences in usage. But I think the point to remember is that all of this work is done with the aim of improving services to students. 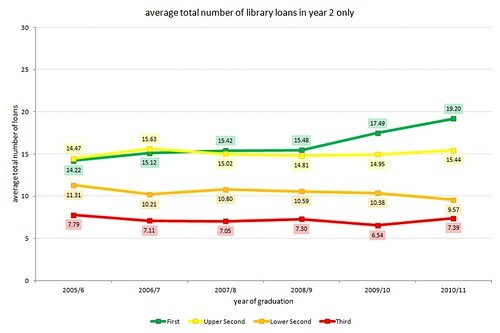 If we can use this data – on a completely anonymous basis (I have nothing to link the data points back to an individual student as the student numbers have been removed before the data was sent to me) – to understand what students are doing, and how it’s affecting their outcomes –and if we remain mindful of our need to protect student confidentiality – I think it can only be a good thing. Ellen and I will be presenting a poster at the LIBER 41st Annual Conference, 27 June – 30 June 2012, University of Tartu, Estonia. We look forward to sharing the early results of Phase II of the project with you and hearing your thoughts. 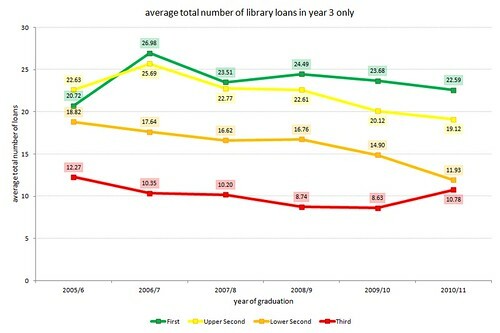 Stone, Graham, Collins, Ellen and Pattern, David (2012) Digging deeper into library data: Understanding how library usage and other factors affect student outcomes. In: LIBER 41st Annual Conference, 27 June – 30 June 2012, University of Tartu, Estonia.